As of today, there is a new, easy to read, mobil version of Thinking Out Loud available. 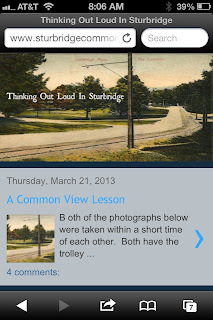 Just point your browser, on your mobile device, to www.sturbridgecommon.com as you always have. Now, you can enjoy this place without fidgeting with the zoom in order to read each post, and comments. Wally, this mobile app is all well and good. But to use it, to enjoy it, we need TOPICS! We need topics that stir up this sleepy town. We need topics that will get people interested in taking their town back! Topics that will incite the townsfolk. Like it or not, you hold the key to get people caring. 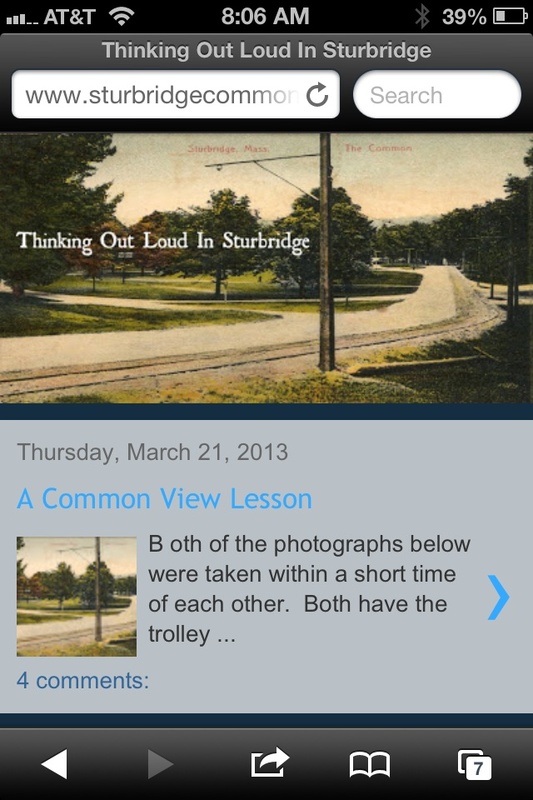 There is no other site that I know of that covers Sturbridge topics. You need to talk it up with friends and neighbors. You need to add news, gossip, and subjects that will stir things up! I have lived in Sturbridge for 13 years. I don't know you. I could have passed you dozens of time and not have realized it. But I envy the fact that you have an opportunity to affect out town in a positive way with your SturbridgeCommon.Com. Talk it up! Make a difference! Thank you for the comment. I appreciate the feedback immensly. I am always open to suggestions.